New York City pizza—many people say it doesn’t get much better than that. The pizza in NYC is so good, they had to name a style of pizza after it! Those large, cheesy, greasy slices of heaven are quite abundant throughout the island of Manhattan. In fact, every borough has a lot of great pizza places. Of course, there will always be debate over who has the best slice of New York pizza. So, you be the judge! Bring along your appetite and take a pizza tour of The Big Apple. You'll think you've died and gone to pizzeria heaven! Many New York pizza places offer what’s called a “Grandma pizza”. This is a thin layer of dough spread into a square pan and topped with mozzarella, crushed tomatoes, garlic and olive oil. You probably won’t see this style of pizza too much outside of New York, so try it while you’re there. If you’re a New Yorker, you most likely have a spot that serves up your favorite pizza. Please be sure and tell us about it below so we can add it to the list. They say the magic of great New York style pizza is the ratio of cheese to sauce (and a thin, airy crust). Here are several pizza places to try and judge for yourself. 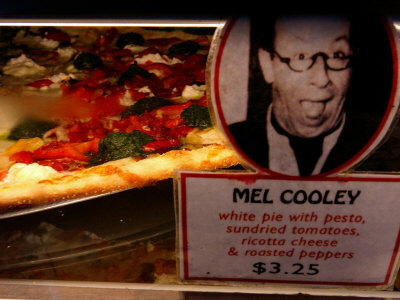 Joe’s is known quite well by celebrities and locals for its heavenly slices of New York style pie. This New York City pizza joint has been slinging tasty pizza slices for 35 years, so you know it’s good. If you’re looking for low carb pizza, Spunto’s is your place. They serve up cracker-thin crust with your choice of base sauce; marinara and cheese, pesto and cheese or extra virgin olive oil. The menu has a large variety of toppings to choose from for your thin crust pie. You can also opt for a nine-grain organic crust. Specialty pizzas, pastas and salads are also on the menu. If you needed a reason to go to Staten Island, now you have one. This pizzeria serves up traditional New York style thin, crispy crust pizza. They also have a vodka sauce pie and a full menu with pastas and salads. Two words…fresh basil. This insanely popular New York City pizza place tops their pies with fresh herbs that are grown right in the window. Combine that with fresh sauce and olive oil and you have a great slice of pie. But be prepared to wait. The line is long and slow-moving. The slices also run around $5. If you want a unique New York pizza, then try a slice of artichoke, crab, Margherita or Sicilian pie. Seating is very limited, if you find any at all—and cash is king here. And like most good New York City pizza joints, be prepared to wait. This Queens pizza joint offers up traditional, thin crust New York style pizza. Nothing fancy, just the classic no-frills cheese pizza. Many locals claim it’s one of the best. This New York City pizza restaurant serves up an awesome Grandma style square pizza that has been cooked up hot in a brick oven. You can also go for the round variety of pizza and choose from a big selection of toppings including spinach, grilled eggplant and grilled zucchini. The menu also offers a good variety of salads, pastas and sandwiches. Visit this NY pizza restaurant for classic Italian pizza and pasta dishes. Their specialty pizzas include a Baked Ziti pizza (yum! ), a Grandma pizza and a Chicken & Vegetable pizza. You can also choose from a wide variety of entrees such as veal, chicken, and pasta dishes. 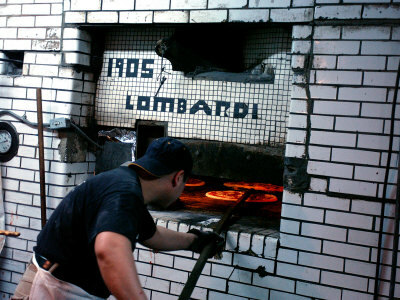 Known for their famous Sicilian pizza, L&B serves up square slices of tasty, tangy pie. The cheese is like one with the dough. Finish your pizza off with some spumoni ice. Or if pizza doesn’t suit you (whaaa?) then try one of their many pasta or seafood dishes. I hear you should try the pizza though. No pressure. This New York pizzeria serves brick oven pizza with several unique specialty combos. Try the Brussel Sprout pie which is topped with roasted Brussel sprouts, crispy bacon, caramelized onion and mozzarella (wow!) or a Mini-Meatball pie. You can also choose from a good selection of salads, pastas and sandwiches. Did we miss some awesome New York City pizza place? Tell us about it and we’ll add it to the list!